When talking with one of our new managers, Derek, he indicated that he noticed three different types of managers at North American Signs. He provided details and insight on why each manager is vital to the company’s success. 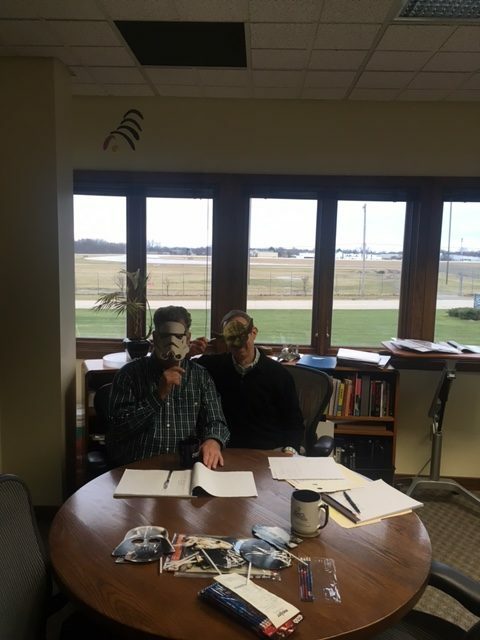 Managers having fun on Extraterrestrial Culture Day. The last type of manager is a wise manager. Derek described this position as a “Wise elder, guiding you, letting you make your own decisions and mistakes, but not letting you fall.” He said this person serves as the middle ground between the fast and detail manager. Always open to questions and concerns the clients and employees may have, this person is a great listener. Derek said they always have the bigger picture in mind and rarely get ahead of themselves. It is evident that the different types of managers all serve a vital role in getting each job done well. The different types of managers weigh each other out with their strengths and weaknesses. Derek wrapped up our conversation stating how much more efficient the work environment has become having each manager play role and some flexibility as circumstances demand. It is possible to take on different roles when you understand the value of each type of manager. John D. Bullough recently published an informative article titled, Factors Affecting Sign Visibility, Conspicuity, and Legibility. It focuses on researched studies about different factors that affect sign visibility. Bullough breaks down sign visibility into two categories; conspicuity and legibility. His use of other research in conjunction with his own findings makes the article a scholarly and reliable source for designers, manufactures, and buyers. One of the first topics Bullough touches upon is the size of the commercial sign. Focusing specifically on conspicuity, he asserts the size of a sign should be based on the average speed a car is travelling when passing a sign. Therefore, signs on a major highway compared to signs in small towns typically can vary in size. The highway signs are much larger because of the increased speed people are travelling at compared to a small town. Bullough claims a way to increase conspicuity is through a border. A border adds contrast to a commercial sign, which in turn makes the sign more difficult to ignore. Adding a border is a great way to make the sign stand out in any environment. The suggestion of adding a border is a reason why this article is so informative. 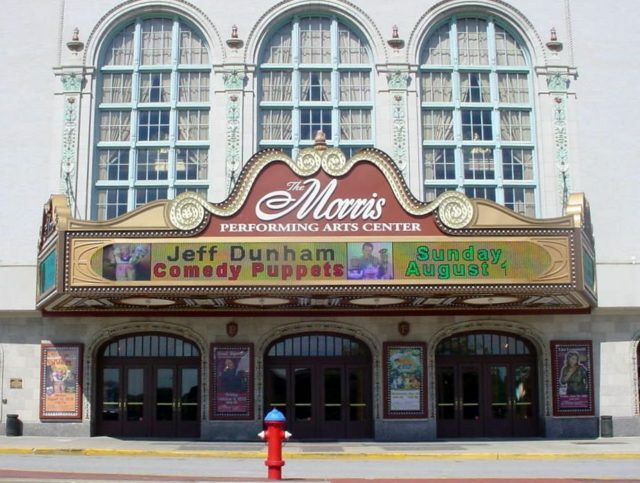 Bullough also recognizes other attributes which add to the commercial sign’s conspicuity such as a color and letter font. The lighting must contrast the rest of the sign to increase conspicuity. Bullough then discusses the subject of luminance and how it relates to conspicuity. While many textbooks state the importance of lighting in gaining attention, he says to keep in mind a few things. First off, it is important to make sure the lit portion of the sign provides contrast to the rest of the sign. For the sign luminance to be effective, a contrast must occur. It is also important to ensure the luminance is not too bright and could lead to distraction. Lastly, flashing lights will make the commercial sign more noticeable. Bullough moves on to discuss legibility by stating how much it influences the reader’s ability to process the information on the commercial sign. What he is saying is, there cannot be too much information on the sign or it will be illegible. Bullough cites prior research saying it takes about 5.5 seconds to read, understand, and respond to a sign. A sign requiring significantly more time to perform these three reactions is not very legible. It was also found that the width of the individual characters on a sign play a large role in legibility. Bullough found one recommendation stating the stroke width should be 18% of the character height. It is important to stay close to this percentage because characters to wide or too small will decrease the legibility. Both conspicuity and legibility determine a commercial sign’s visibility. Bullough does a great job explaining factors that increase and decrease the sign’s visibility. Careful attention to each of the conspicuity and legibility factors will lead to more successful commercial signs. While conducting interviews with employees in various departments within North American Signs, we came across a common theme. 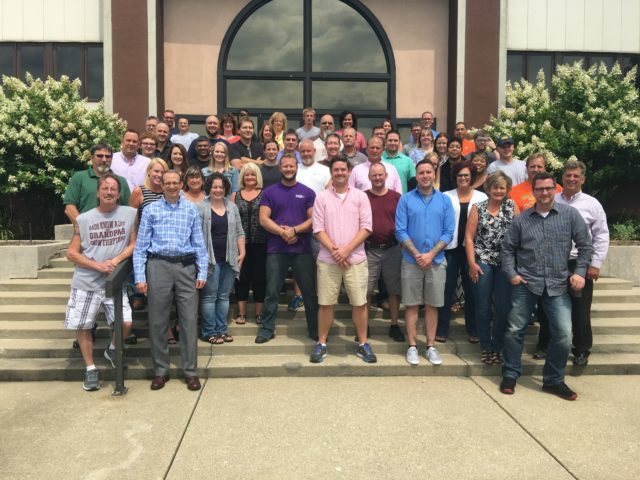 When asked, “What is your favorite part of working at North American Signs?” The most popular answer was the people. Thais Ladas worked at the company for more than 30 years, and has since retired. She saw many employees walk in and out of the doors over the years and enjoyed friendships with nearly all of them. “I love the people I work with and, you can imagine over the years, they have changed many times…it is nice to know that the bulk of the people that you’re working with are wonderful.” Though it was hard to leave North American Signs, she felt she was leaving it in the right hands. It was partially due to the employees that made retiring an easy and hard goodbye. Knowing all of her hard work was going to be taken care of was a relief, but not seeing all of her friends at North American Signs made Thais’ retirement bittersweet for everyone. While not everyone’s story is as heartfelt as Thais’, the same general answer came from the question, “What is your favorite part of working at North American Signs.” Some employees, like Bret, hesitated at first, racking his brain for the best answer. Bret concluded, “The people. I mean I enjoy the type of work, but I enjoy the people more.” Some, like Randy, enjoy the employees because of the comic relief they bring. “They got some great people here; we have a lot of fun together.” The people who make up North American Signs encourage each other to get things done through comic relief . A couple employees even consider the people they work with as family. Brian described the employees he works with saying, “It’s like a family…I spend more time with the people here than I do with my own family.” After being with coworkers for hours on end, Brian and others start to consider the other employees family because of the relationships they form. The family environment that exists at North American Signs also makes work much more enjoyable. Derek Tobolski said, “It’s a big family…we’ve went through some rocky times, some hard times, but at the end everybody seems to come together and I think that makes coming to work more enjoyable.” An enjoyable workplace is one of the reasons why many employees have been working at North American Signs for 10 plus years. When focusing on marketing and advertising, many companies under invest in their signage. Failure to spend both time and money on proper signage is a lost opportunity for any type of business. Unfortunately, many people do not realize the economic value commercial signage brings to a business. Signs have the ability to positively impact consumers and communities, increase business performance, and increase their own worth. All of these signage capabilities have been researched and published by the Sign Research Foundation. North American Signs, once called South Bend Neon, has been helping companies boost sales with our signage for over 80 years. Commercial signage positively impacts consumers and communities. Research states, “In a case study of 8 San Diego auto dealers, 68% of people surveyed said that the sign had been an important factor in finding the dealer’s location” (The Economic Value of On-Premise Signage, See executive summary). Without conspicuous signs, many consumers have a hard time finding businesses. This can lead to frustrated consumers and even dangerous driving behavior. Therefore, an appropriately designed sign positively influenced a consumer’s opinion of the business. Commercial signage also has the power to increase a business’ performance. Repairing signs shows a 10% increase in sales for 60% of businesses studied (See executive summary). People perceive not only what type product or service a business offers but also judge a business by the curb appeal, which is largely influenced by the signage. If a sign is outdated or not taken care of properly, people are likely to assume the business is also outdated or not cared for. On the other hand, if a sign is designed well, it can increase foot traffic. A survey performed by the BrandSpark Better Homes and Gardens American Shopper study found, “29% of American consumers report that they have been drawn into unfamiliar stores based on the quality of the store’s signage.” So a well designed sign grabs the target audience’s attention, and attracts consumers who might not have stopped in before. Unlike many investments made by a company, a commercial sign does not necessarily depreciate in value. The value of a sign is reinforced every time it causes someone to engage in the business. In the article, The Importance of Signage of Repositioning Your Brand, the authors emphasize the key role a sign plays in a business’ advertising. “It is an advertising investment that you make once, and yet it continues to work for you…24 hours a day, 7 days a week.” Investing in a sign is a onetime purchase, yet it is constantly drawing customers into a business. It is reported that 29% of North American shoppers base where they shop on the information communicated by the store signs (see executive summary). A commercial sign can be a large investment, but its value grows with every customer it brings to the business. Commercial signage has a large amount of economic value for a business. A well designed sign can positively influence consumer’s view of the business and increase the business’s performance. Lastly, the value of the commercial sign increases over time if it is well kept. It is an investment that grows in value by drawing consumers in. It is in any marketing team’s best interest to spend time focusing on the signage of the business. In doing this, they are bound to bring in more customers and increase the overall perception of their company. This infographic provides an overview of commercial sign purchasing issues with connections to related materials. It is based on information from How to Buy an Electric Sign by Noel Yarger and the associated blog posts at North American Signs. We hope it is informative and helpful to everyone purchasing commercial signs. Created using Visme. An easy-to-use Infographic Maker. The purpose of a commercial sign is to gain the attention of consumers. 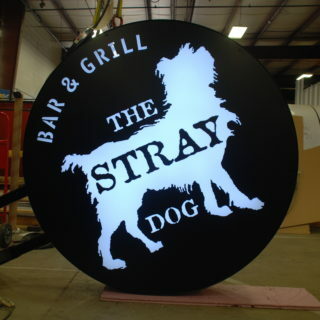 In order to maximize a sign’s purpose and value, there are various details that enhance the attention a sign attracts. In a highly populated area, sign competition increases dramatically compared to a more rural area. Though it is important to always buy a visually appealing sign, it becomes even more important when encountering competition. Referring to a sign specialist at an experienced sign company will ensure the sign will stand out from any competition. Movement is a way to catch attention. Therefore, a commercial sign with any type of movement is more likely to catch a person’s attention compared to a stationary sign. It is important that a sign buyer is knowledgeable of the sign regulations in their town. Some areas prohibit certain types of sign movement. If this is the case, the sign company should know of a way to work around the regulations. of excitement and entertainment. If used in the correct manner, flashing signs can draw a lot of attention to a business. 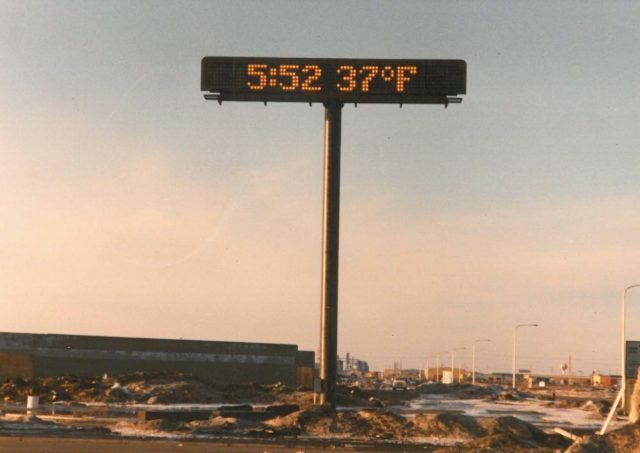 Time and temperature signs serve as an amenity to the public. Consumers may have a more positive view of a business that invests in one of these signs because of the service they are providing to the community. Along with the generosity of providing a time and temperature sign, it also gains the attention of consumers. When speaking with merchants located across the street from a time and temperature sign, the merchants have found a pattern. Many customers who have trouble finding their business state they were so concentrated on the time and temperature sign across the street that they missed the business they were actually looking for. Many businesses fail to realize all of the details that go into making a well designed sign. This is just another reason it is important to invest in a sign company that knows how to create the best sign for your business. Incorporating one or more than one of the above factors will increase the commercial sign’s value to the business. In 2014, the International Sign Association (ISA) started promoting National Manufacturing Day. The National Association of Manufactures concieved the event, and ISA saw the value in the event for the sign industry. The event has grown into an annual affair for North American Signs (NAS), occurring every October. It has been a great way to show students in the community the benefits of working for a national sign manufacturer. 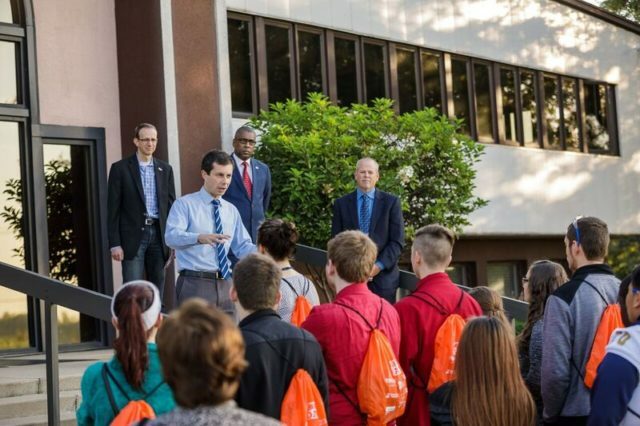 Mayor Pete Buttigieg gives Manufacturing Day Proclamation in 2016. 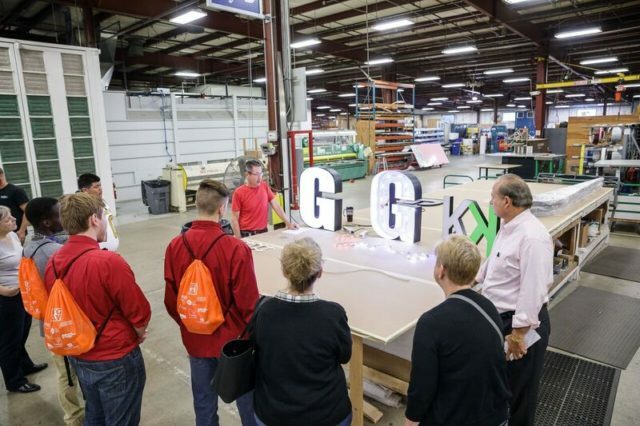 Students learn about sign manufacturing. Manufacturing Day is a nationally recognized day where students of all ages can visit participating manufacturing companies. The goal of the day is to promote both careers in manufacturing, and “us”, as a national sign manufacturer. In mid September of 2014 Dee Mackenzie, our director of human resources, decided to add NAS to the Manufacturing Day website. Employees from the South Bend Regional Chamber of Commerce (SBRC) saw the entry and approached NAS about the event. In less than a month, NAS worked with the SBRC to organize the event. We gathered 26 manufacturing companies and over 500 students in St. Joseph County to participate in the day-long event. As a result, the event had the largest concentration of participants in the country. On Manufacturing Day in 2015, students were asked to answer a series of questions throughout the day. Before the tours started only 46% of participating students were considering a career in manufacturing. After the tours were complete, 88% of students indicated they would consider a career in manufacturing. Following the most recent Manufacturing Day in 2016, a number of students who toured NAS followed up with feedback about their experience. Some found it fascinating to learn about the different materials and steps that go into making a sign. Others stated their appreciation for the opportunity to learn about a career field they had yet to consider. Overall, the students were extremely grateful to tour NAS and learn of all the different manufacturing jobs available. Since 2014, the event has grown throughout the local school system with over 600 participants in 2016. Elkhart County manufacturing companies also participated in the day for the first time in 2016, and had many student participants as well. Our current team also enjoys the opportunity to see students eyes light up and new possibilities appear. Inspiring others creates its own rewards. Manufacturing Day is just one of the many ISA opportunities NAS has participated in as a national sign manufacturer. The opportunity to influence students and show them a meaningful career in national sign manufacturing makes this a rewarding experience. We look forward to hosting a new generation of students at St. Joseph County’s 4th annual Manufacturing Day held on October 6th, 2017. A commercial sign is an easy and smart way to emphasize and advertise a business’ brand. A clear focus on branding the actual site of your bricks and mortar business will help ensure it is distinctive and memorable. Because signs are available to all consumers passing by them, they can be a memory jogger, and add to the curb appeal of the business. This well designed commercial sign captures what the building offers while adding to the curb appeal. Unlike other advertising methods such as the radio, magazines, newspapers, television, and many more; consumers cannot choose whether or not they see a commercial sign. All people driving by a sign tend to notice it. Commercial signs are unlike other forms of advertising because you can turn off the TV or choose not to read a specific type of magazine. A sign reaches a larger audience. Since a commercial sign reaches such a large and diverse audience, it allows businesses to market themselves immediately to customers who were unfamiliar with the business and are on or near the site. If a commercial sign is designed properly, it can serve as a reminder as to what the business offers. Since they can be seen repeatedly, commercial signs reinforce memory of the business to past, present, or future customers. These brand impressions raise the likelihood that a consumer will remember the business when the need for that business arises. This is one of the simplest ways to advertise a business to the general public 24/7. If a business fails to take advantage of the branding capability of the storefront by creating a non-uniform appearance, it cannot reap the full benefits of the signage investment. A commercial sign can add character to a business. It informs consumers about the types of goods or services offered locally available. “Signage can be used to turn an ordinary empty box-shaped building into any environment desired to satisfy the tastes of customers the business wishes to attract”( On-Premise Signs). The curb appeal of a business is one way a business brands itself to the general public. A commercial sign can add value to the overall brand by increasing the curb appeal of the business. Failure to use a commercial sign appropriately is a failure to brand a business to the fullest. Signs have the ability to reach people outside of their target audience because anyone can drive by them. They can also remind customers about the business because they are public and easily viewable. Lastly, commercial signs can build a business’s appearance through adequate sign design. Commercial signage is a simple way to increase the value of your business, and your brand. Going into this summer internship, I had very few expectations. But, the expectations I did have were quickly enhanced within my first week at North American Signs (NAS). Both Iris and I were presented with countless opportunities to explore various avenues of the business. From the very first day, both Iris and I felt welcomed at NAS. Going around and meeting all of the friendly faces that make up the company was one of the first indicators of what type of environment we would be working in. People were welcoming and open to any questions we may come across throughout the summer. I could tell how invested John, the CEO and owner, was by knowing the employee’s names and the role they played in the company. John also wanted to make clear that our time here was supposed to be both beneficial to NAS and to us. From the very first week, he asked us what opportunities we were hoping to have during the internship. 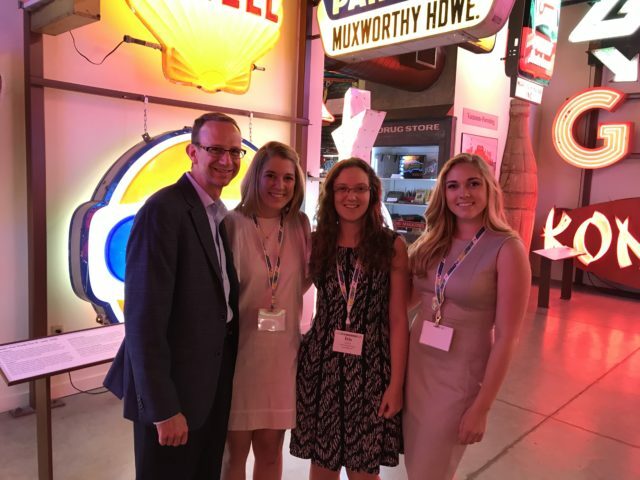 John and the summer interns at the American Sign Museum. Within the first week or two, John gave both Iris and I a few assignments. He did this knowing we would have an ample amount of time to read through the signage textbooks he gave us. At first, I did not understand the point to reading the textbooks, but I later realized how important they were. Neither Iris nor I had any experience or exposure in the industry. Such a vital part of a business’ advertising and marketing is almost nonexistent in any marketing textbook. The readings provided knowledge on the importance of commercial signage, sign design, the economic value of signs, and much more. After absorbing the information from the readings, we were ready to dive into our assignments. Though we learned a lot in the office, our favorite part of the summer was attending the Midwest Sign Association conference in Cincinnati. We had the opportunity to attend a board of directors meeting and multiple seminars on how to build a company. These were events most people do not experience until graduating college. The best part of the trip was going to the American Sign Museum for dinner. It is truly one of the great treasures of the sign industry. Filled with various signs, the museum creates the exciting and unique atmosphere which signs have continually built for businesses throughout the years. Needless to say, Iris and I developed skills that can be used in various future endeavors. From writing blog posts to designing marketing materials, we have learned a lot about the industry and ourselves. Through our many opportunities over the summer, we have grown into better students, employees, and people. One of the first steps in sign design is pinpointing who the target audience is. Knowing the audience determines many aspects about the design of the sign. Once the target audience is identified, it is important to layout the sign with the audience in mind. These are a few basic aspects to pay attention to while designing a sign. The color scheme used for the logo or other marketing materials should also be used for the sign. If it is a new company or the company is rebranding, there are specific colors to use depending on the target audience. The informational textbook, On-Premise Signs places specific emotions with basic colors based on psychological research. The researcher’s state red is associated with excitement, which is why it is often used for warnings or alerts. Blue is typically paired with calmness, which is why it is often associated with banks and hospitals. Green signals freshness and youth, while yellow is identified with cheerfulness and warmth. The shape and size of a sign’s font has more of an impact then most would think. This is because viewers subconsciously associate certain fonts with specific emotions. On-Premise Signs, states, “An upward slant in a line of text is often associated with positive attributes and a downwards slant may indicate negativity.” The authors also suggest thin letters express simplicity whereas thicker letters indicate self-confidence and boldness. Lastly, they suggest being wary of using all capital letters because it typically indicates pretentiousness. By considering these researched emotions brought on by specific fonts, the likelihood of attracting your target audience will increase. The font used on the top sign violates the capital letter idea. A bakery is not a business one typically considers pretentious. Because of this, the font on the bottom sign is more suitable for the business. Arguably, the most important of the three aspects in branding your business to your audience is the logo. The logo is an important part of the sign because it helps the customer perceive what the business is. The color and font of the sign are both crucial towards catching your target audience, but it is the logo that ties everything together. This is largely due to the fact that, “symbols and logos are read much more quickly than words” (The Signage Sourcebook, 71). Logos enhance sign conspicuity because they do not have to be read to be understood. A logo that accurately represents the company will increase the value your sign has for your business. Knowing the audience is the first step in designing a sign. From there, you can determine main features such as color, font, and logo based on the target audience. Color has the ability to portray the overall theme or vibe of the business. The font gives the customers a sense of familiarity as to what type of business it is. Lastly, the logo enhances the sign’s brand and increases the value of the sign. Being selective with these three factors in order to reach your target audience will help ensure that your sign communicates the message you wish to send. Six Ways: Signs Can Increase Your ROI! Unwavering, unfaltering, dedicated focus on helping you protect your brand, solve your problems, and exceed your expectations. By anticipating issues and presenting you with workable solutions, our customers tell us that we perform the equivalent of magic: we give you more time — time for planning, strategy, marketing and personnel. Essentially, the time you need to focus on all the other things on your list. So, go ahead, we’ve got this. © Copyright 2019 - North American Signs - Business & Retail Storefront Letter Set & Signage Manufacturing.